Download "FREQUENTLY ASKED QUESTIONS FAMILY COURT MEDIATION PROGRAM"
1 FREQUENTLY ASKED QUESTIONS FAMILY COURT MEDIATION PROGRAM What is mediation? Mediation is a private, voluntary process in which parties meet with a neutral third party who will help them work through conflicts and come to an agreement on issues in their case. Success of the mediation depends on the participants willingness to work cooperatively to reach an agreement. Participants can expect mediation sessions to last up to two (2) hours. What does a mediator do? A mediator helps people discuss issues, explore options to settle conflicts, and resolve differences in order to reach a final agreement on matters before the court. The mediator is a neutral third party, which means he or she cannot take sides in your case. Who attends mediation sessions? In addition to the mediator, only the two (2) people named on court documents as the plaintiff and the defendant attend the mediation sessions. Your lawyer may be available to consult with you before and after the mediation and to review any agreement. What are the benefits of mediation? 1. The outcome of a case is determined by the two (2) parties, not by a judge. 2. It is typically less costly than litigation. 3. It can be less time-consuming. 4. The process is private. 5. It can improve communication between parties. 6. It promotes cooperation in decision-making about children. 7. It can reduce conflict between parents, which benefits their children. Can we meet with a mediator before filing a case in Family Court? If you DO NOT have a case pending in the Family Court yet, you and the other party can meet with a private mediator to work out an agreement before you file your case in the Family Court. The Rhode Island Mediators Association has an online directory of local mediators with contact information. Visit or call (401) for more information. 2 The Family Court employs skilled mediators, but you must have a case pending before the court to use its mediation services. You will be referred for mediation automatically if your case includes a motion to establish child custody, parenting time, or placement of a child and if the parents of the child are not married at the time of the filing. This is called a miscellaneous case, and the case number will have an M at the end. If your case involves divorce or a motion to change an existing court order, on the day of your hearing you can ask the judge or magistrate to refer your case to mediation. Likewise, if your miscellaneous case could not be scheduled for mediation before your first hearing, you can ask the judge or magistrate to refer your case to mediation. 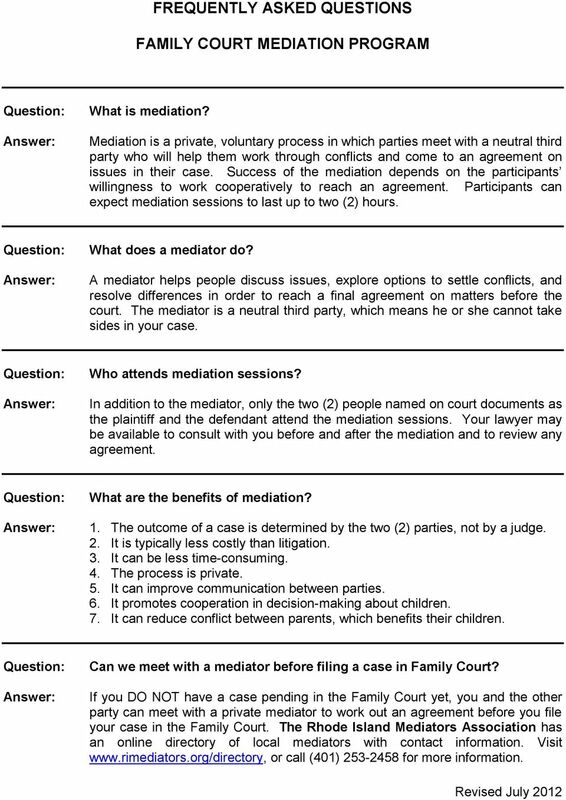 How are court mediation sessions scheduled? New cases involving child custody, placement, and parenting time. The court requires that new cases involving child custody, parenting time, and child placement (such case numbers end with the letter M ) shall be referred for mediation. Family Court staff will move forward with scheduling a mediation session for you as soon as they know that the defendant in the case has been served with a summons and a copy of the complaint. The defendant is the person who did NOT file papers with the court. Soon after your miscellaneous complaint is filed in court, you will receive a letter from the Mediation Unit asking you to call when the other party has been served. NOTE: Proof of Service of Process is necessary. If you are the person who filed a complaint with the court (the plaintiff), it is very important that you or your attorney inform the court when you learn that a summons and copy of the complaint were served to the other party. When the sheriffs or constables serve those documents on the other party, they must fill out a Proof of Service document on the other side of the summons. The Proof of Service form will be sent to the plaintiff and then it must be returned to the Domestic Relations Clerk s Office immediately. When the Mediation Unit sees that service of process is complete and proof has been returned to the court, staff will schedule a mediation session. 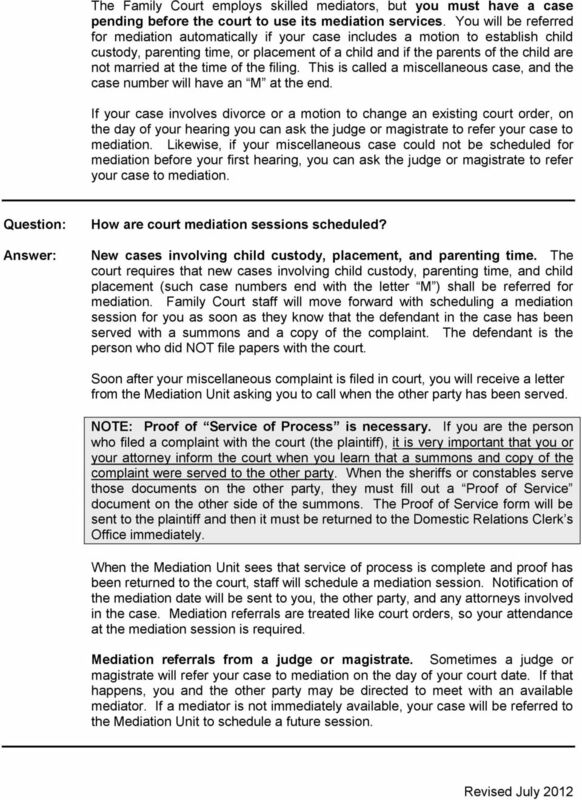 Notification of the mediation date will be sent to you, the other party, and any attorneys involved in the case. Mediation referrals are treated like court orders, so your attendance at the mediation session is required. Mediation referrals from a judge or magistrate. Sometimes a judge or magistrate will refer your case to mediation on the day of your court date. If that happens, you and the other party may be directed to meet with an available mediator. If a mediator is not immediately available, your case will be referred to the Mediation Unit to schedule a future session. 3 Where are mediations held? In Providence/Bristol County cases, scheduled mediation sessions are held in the Mediation Unit (Suite 3A) on the third floor of the Family Court in the J. Joseph Garrahy Judicial Complex in Providence. Mediations that take place on the day of your court hearing sometimes take place near your courtroom on the fifth floor. If your case will be heard in Kent County, Washington County, or Newport County, mediations taking place on the day of your hearing will take place at your county courthouse. If you live in Kent County, Washington County, or Newport County and have a mediation session scheduled on a day when you are not expected to be in court, it is possible that you will be required to attend mediation at a different courthouse. Do I need a lawyer? You should consult with an attorney when possible. Lawyers help their clients understand the law, make informed decisions, prepare orders for the judge s signature, and complete the legal procedures necessary to protect your legal interests. Lawyers typically do not attend mediation sessions, but may be available to their clients before, during, and after the mediation. 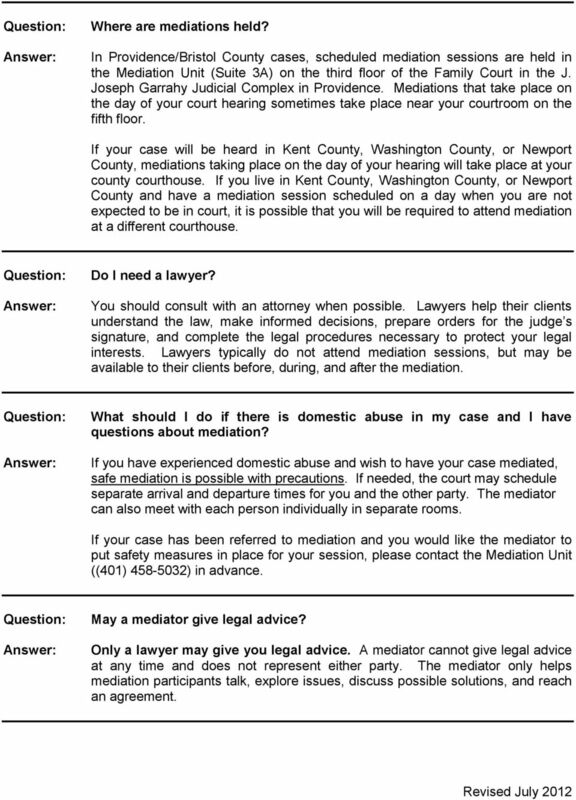 What should I do if there is domestic abuse in my case and I have questions about mediation? If you have experienced domestic abuse and wish to have your case mediated, safe mediation is possible with precautions. If needed, the court may schedule separate arrival and departure times for you and the other party. The mediator can also meet with each person individually in separate rooms. 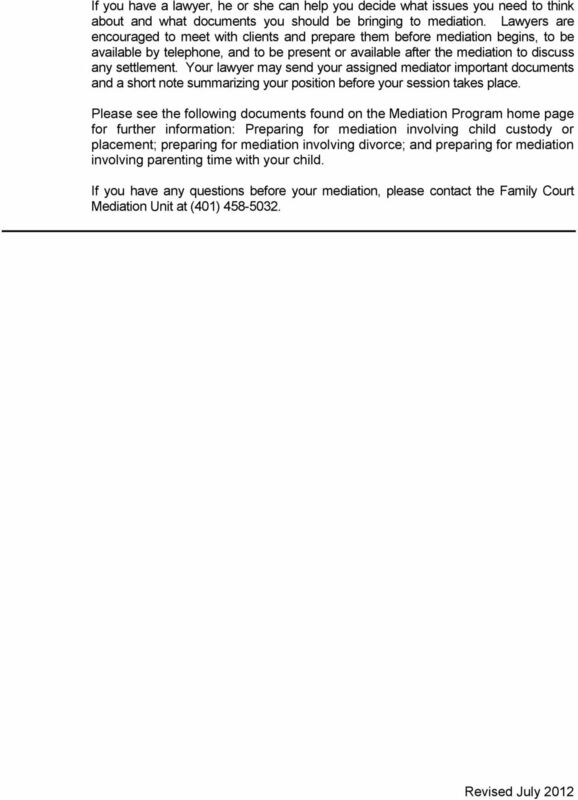 If your case has been referred to mediation and you would like the mediator to put safety measures in place for your session, please contact the Mediation Unit ((401) ) in advance. May a mediator give legal advice? Only a lawyer may give you legal advice. A mediator cannot give legal advice at any time and does not represent either party. The mediator only helps mediation participants talk, explore issues, discuss possible solutions, and reach an agreement. 4 What happens at the end of our mediation session? 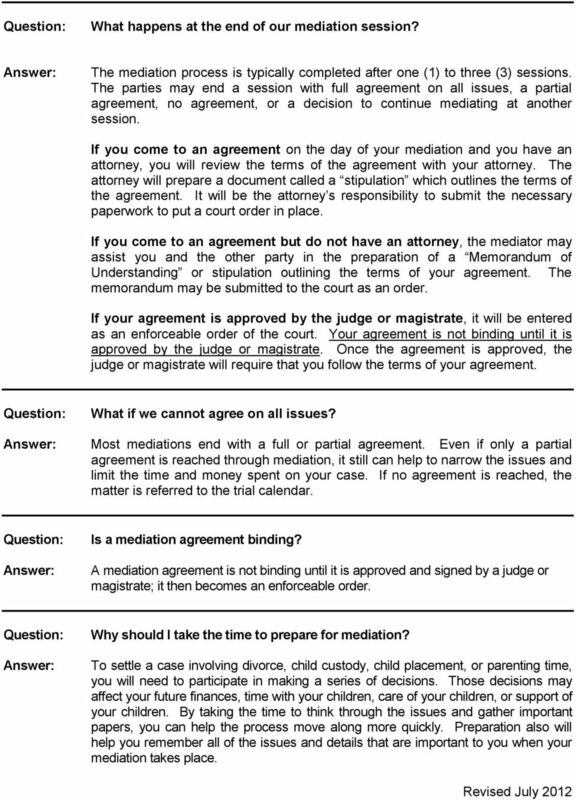 The mediation process is typically completed after one (1) to three (3) sessions. The parties may end a session with full agreement on all issues, a partial agreement, no agreement, or a decision to continue mediating at another session. If you come to an agreement on the day of your mediation and you have an attorney, you will review the terms of the agreement with your attorney. The attorney will prepare a document called a stipulation which outlines the terms of the agreement. It will be the attorney s responsibility to submit the necessary paperwork to put a court order in place. If you come to an agreement but do not have an attorney, the mediator may assist you and the other party in the preparation of a Memorandum of Understanding or stipulation outlining the terms of your agreement. The memorandum may be submitted to the court as an order. If your agreement is approved by the judge or magistrate, it will be entered as an enforceable order of the court. Your agreement is not binding until it is approved by the judge or magistrate. Once the agreement is approved, the judge or magistrate will require that you follow the terms of your agreement. What if we cannot agree on all issues? Most mediations end with a full or partial agreement. Even if only a partial agreement is reached through mediation, it still can help to narrow the issues and limit the time and money spent on your case. If no agreement is reached, the matter is referred to the trial calendar. Is a mediation agreement binding? A mediation agreement is not binding until it is approved and signed by a judge or magistrate; it then becomes an enforceable order. Why should I take the time to prepare for mediation? To settle a case involving divorce, child custody, child placement, or parenting time, you will need to participate in making a series of decisions. Those decisions may affect your future finances, time with your children, care of your children, or support of your children. By taking the time to think through the issues and gather important papers, you can help the process move along more quickly. Preparation also will help you remember all of the issues and details that are important to you when your mediation takes place. When should these forms be used? Instructions and Forms Divorce: No Children Court Personnel Cannot Help You Fill out the Form(s) in this Packet. You may only use these forms if your answer to all of the following statements is "yes"
South Carolina. The information below applies only to South Carolina. 1. How can I find out if I have a IV-D child support case in this state? IN THE COUNTY COURT IN AND FOR WAKULLA COUNTY, FLORIDA. Case No. The Public Defender cannot file these motions for you or represent you in your hearing unless the Court appoints us to do so. The form in this booklet lets you ask the court to postpone when the landlord can get an Execution and to allow you more time to find new housing. LITIGATION SECTION INTERNSHIP PROGRAM FINAL REPORT Family Violence Prevention Services, Inc.
February, 2007. The Self Help Legal Center. Southern Illinois University School Of Law Carbondale, IL 62901 (618) 453-3217 e-mail: selfhelp@siu.